The eastern slopes of Table Mountain form the magnificent backdrop to Kirstenbosch National Botanical Garden. The rocks that make up Table Mountain and the Cape Peninsula tell the story of what was here in ancient times and how it came to look as we know it today. The sheer, silver-grey rocky cliffs that tower 1085 m above Kirstenbosch are a 600 m thick slab of hard and durable, coarse, pebbly, quartz sandstone, known as the Peninsula Formation. It rests on alternating layers of pink siltstone, maroon mudstone and pale brown sandstone, which together make up the 70 m thick Graafwater Formation. Both rest on bedrock of Cape Granite, which is easy to recognise because it looks like a cake mixture of bits of translucent white, pink, glassy brown and black. An easy way to see bits of rock from all these rock formations is to look in the streambeds, where broken off pieces all get mixed together. 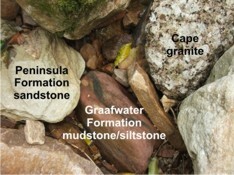 The rocks of the Peninsula and Graafwater formations are sedimentary. Sedimentary rocks are formed by slow deposition of sand and mud in water. 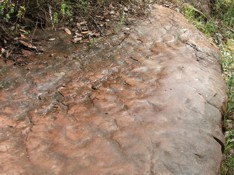 Some rocks of the Graafwater formation have preserved ripple marks and mud-crack patterns that can be seen on the exposed surfaces. Look out for the pictured rock on the 300 m contour path between the point where it enters Kirstenbosch from Cecelia Plantation and Vaalkatkloof. Notice also the step-like outcrops of maroon Graafwater rocks on the left hand side of the path as it enters Vaalkatkloof from the direction of Cecelia Plantation. The granite is igneous rock, formed when molten rock deep below the Earth’s surface, known as magma, is pushed up towards the surface where it cools and crystallises to form granite rock. Exposed Cape granite can be seen at Skeleton Waterfall where Skeleton Stream has washed away the sandstone to reveal the granite bedrock that forms the waterfall. The rocks are continually being broken down and the mountains eroded away by wind and rain. The evidence is all around in the form of fallen rocks and boulders scattered on the lower slopes. The sandstone of the Peninsula Formation is hard and resists weathering. The cliffs erode by overhang collapse, where the lower, softer layers of the Graafwater Formation erode away leaving sandstone overhangs, and gravity eventually causes large blocks to come crashing down. The most impressive overhanging cliffs can be seen above Dassieklip on the Silvertree Trail. There are many massive boulders on the lower slopes, one of the biggest, known as Big Rock, is at the point where the 300 m contour path from Newlands Forest enters the Kirstenbosch Estate. There are also occasional slope failures caused by heavy rains, where the thin soil layers on the lower slopes slip down, taking plants, even trees, with it. Two large landslips that occurred in 2002 still scar the mountainside and can be seen on the 300 m contour path between Skeleton Gorge and Window Gorge. The soils derived from granite and shale are more nutrient-rich than those derived from sandstone, so the lower slopes and valleys can support more vegetation than the thin, nutrient-poor soils of the upper slopes and plateaux. The reddish colour of the soil of Kirstenbosch, most noticeable on lower contour path, is due to the minute amount of iron present in the granite, which stains the soil. Table Mountain has very ancient origins and lies on top of even more ancient bedrock. Around 560 to 540 million years ago, this area was a sea on the edge of an ancient continent. The mud and muddy sands that were deposited on the bed of that ancient sea are today the rocks that lie under Cape Town. They are known as the Malmesbury shales. Movement of the continents 540 million years ago forced huge blobs of molten rock from deep inside the Earth’s crust (magma) up into the Malmesbury shales. The magma cooled and crystallised to form the Cape granite. Granite underlies Kirstenbosch and the southern Peninsula, while Malmesbury rocks underlie the CBD, Cape Flats and the Swartland. The continents collided, pushing the Malmesbury shales and Cape granite up to the surface and exposing them so that over the next 30 to 40 million years, they were eroded into a flat plain. That plain became an inland sea and river delta. Over the next 170 million years, between 510 and 340 million years ago, the mud and sand that was washed off the ancient continent was deposited on top of the Malmesbury rocks and granite. As the plain sunk, the mud and sand were buried, compressed and cemented to form nearly horizontal layers of shale and sandstone. More and more sand was deposited until the sandstone was 7 km thick. These rocks are known as the Cape Supergroup. Table Mountain is made up of the bottom layers of the Cape Supergroup. Between 280 and 235 million years ago the collisions between the continents that created Pangaea, caused the 7 km thick sandstone rocks to be folded, compressed and crumpled up while it was also lifted up to form a massive mountain chain, the Cape Fold Belt Mountains. The mountains we see today are just the remnants of a mountain chain that once must have been as mighty as the Rockies. In fact the mountains that remain are the troughs, or low points, of this ancient mountain chain. For the last 400 million years, they have been eroding away, the sand washing into the sea to form the rocks of the future. Pangaea started to break apart 180 million years ago. It was this event that caused the massive outpouring of lava that created the Drakensberg Mountains. In Cape Town a number of 130 million year old dolerite dykes mark the event. They are pillars of black rock that slice through the bedrock Malmesbury rocks and Cape granite, and the sandstone. At Kirstenbosch, a dolerite dyke crops out on the 300 m contour path just north of the Nursery Ravine path. It is difficult to spot because the distinctive black rock has weathered brown, making it look just like the other rocks. For a map of the trails of Kirstenbosch which also marks geological and other points of interest, purchase the Kirstenbosch Walks and Trails brochure for R5 from the Ticket Office. For more information about the geology of the Cape Peninsula see John S. Compton’s very readable book: The Rocks and Mountains of Cape Town.